Leaves Lodge is undoubtedly one of Nelspruita��s most luxurious and beautiful destinations. Situated on one of the towna��s distinctive granite outcrops Leaves lodge and spa is in a quiet suburb overlooking the lush indigenous vegetation of a nature reserve and the balmy Lowveld weather makes this the perfect place to visit for a winter getaway. The lodge boasts exceptionally stylish modern architecture and rooms of five-star quality. All the accommodation – from the superior and luxury rooms to the self-catering rooms and Presidential Suites- features DSTV, air conditioning, minibars and free wireless internet. The most luxurious and indulgent options are the two Presidential Suites, which have all the ingredients for a couplea��s dream holiday. Rose is a stand-alone house with its own private swimming pool, a huge 100m2 living space with a kitchen, dining room and lounge, a bedroom with an extra length king-size bed and a gorgeous bathroom with a freestanding bath and large shower. 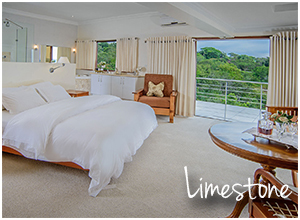 Meanwhile, Limestone is arguably the grandest luxury room in Nelspruit, boasting an expansive balcony with spectacular views over the indigenous forest and the city beyond. Therea��s a walk-in dressing room with full floor mirrors, as well as an open-plan bathroom with a jet bath, double basins and double shower. Leaves lodge has fourteen individually-decorated superior rooms which dona��t compromise on luxury either, they are all very comfortable and well-equipped. Although slightly less spacious, the eight luxury rooms are still extremely comfortable, and perfectly suited for everyone from couples on a budget to overnighters and businessmen. Rates include a delicious breakfast. Self-caterers are spoilt for choice too. Treetops a�� a magnificent four bedroom house with sublime finishes, a private swimming pool and comprehensively appointed living areas a�� is perfect for a luxury holiday with family or friends. Petals is another luxurious stand-alone house with three en-suite bedrooms, spacious living areas, and a verandah. Meanwhile, the Cottage is a charming, affordable duplex unit sleeping up to four adults and two children. The lodge is also perfect if youa��re looking to treat yourself or a loved one to some pampering this winter, boasting one of the best spas in the city. The spa boasts a beautiful outdoor treatment deck, double treatment rooms, an outdoor hydro jet pool and a heated pool with lovely views over the nature reserve. Leaves Lodge is well-positioned close to the Nelspruit CBD, various restaurants and attractions such as the Lowveld National Botanical Gardens, the Panorama Route and the Kruger National Park.